Successfully Added MINIX N42C-4 Mini PC - Windows 10 Pro 64BIT, Apollo Lake CPU, Intel HD Graphics, 4GB RAM, 32GB Memory to your Shopping Cart. Powered by the Intel N4200 Apollo Lake Processor and 4GB DDR3L RAM for a smooth performance. Intel Graphics card provides better and clearer visuals. 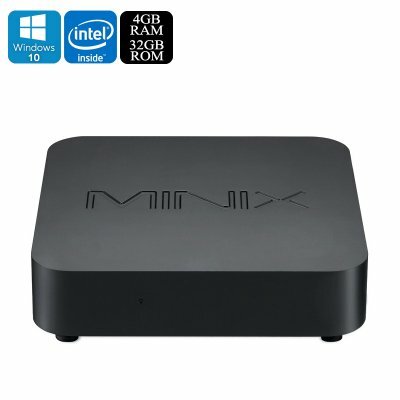 The Minix N42C-4 provides the functionality and power of a desktop computer in a stylish and compact form. This mini PC is powered by Intel processor N4200 Apollo Lake CPU and 4GB RAM, making it super fast to offer an exceptional experience. The Windows 10 operating system is pre-installed, so you won’t have to set up the system as it is ready to run right out of the box. It is designed to provide smooth and stable performance and operation. The PC has an active cooling solution that produces minimum noise and causes no disturbance. The design of the mini PC contains air holes and ventilation to maximize airflow. It helps in maintaining the correct temperature and prevents over-heating. This PC is equipped with Intel HD Graphics 505 GPU that is perfect for providing clear, bright, and sharp graphics. You can play heavy games without having to compromise the quality of graphics. It is capable of producing crystal-clear, super detailed and HD visuals effortlessly. The mini PC supports multiple media formats, the video format includes 4K, MPEG, MPEG1, MPEG2, WMV, MPEG4, HD, and MKV. The audio format includes AAC, MP3, WMA, APE, and FLAC. The photo format it supports is JPEG, PNG, GIF, and JPG. The internal storage capacity of the mini PC is 32 GB and with 3 USB 3.0 ports as well as USB type C you can easily expand this with external storage. It also has two 2280 M.2 slot SODIMM slots. This enables you to expand the RAM up to 8GB. The interface of the mini PC contains 3 USB 3.0 ports, 1 Ethernet port, 1 USB Type-C port, 1 mini DP, 1 DC Power, 1 SPDIF, and 1 HDMI 1.4.You can connect it a full HD monitor and enjoy your favorite media on the big screen. The mini PC has Wi-Fi- and Bluetooth supports making it easy to share and connect with other devices. You can surf the internet and share content with your family and friends without any difficulty. The Minix N42C-4 comes with a 12 months warranty. It is brought to you by the leader in electronic devices as well as wholesale gadgets,.